According to the Rocky Mountain Insurance Information Association, motor vehicle crashes are the leading cause of death among 15- to 20-year-olds, and 16-year-olds are 3 times more likely to die in a motor vehicle accident. For these reasons, parents of teen drivers must be super vigilant and take precautions to help keep their teens safe and to avoid preventable accidents. One way parents can help keep their teen drivers safe is to discuss the house driving rules. Here’s 10 rules of the road that all parents should set for their teen drivers. Since the laws for teen drivers may vary from state to state, it’s important that both you and your teen clearly understand the teen driving laws in your state and that your teen agree to abide by them and all speed limits at all times. It’s important to communicate to your teen that wearing a seatbelt is not optional for anyone inside of the vehicle. Set the example by always buckling up. More and more accidents are occurring as a result of driver distraction due to texting and talking while driving. Set an example by turning off your phone while driving and insisting that your teen do the same. Clearly communicate your teen the risks associated while drinking and/or drugging and driving and strictly forbid the use of alcohol and drugs by your teen. It’s important that your teen know that should he question his ability to drive for any reason, you’re only a phone call away. Promise not to yell or scream at your teen for calling and to promptly pick him up. As your teen learns to drive without supervision, it’s vital that he stay focused. For that reason, driving with friends should be discouraged during the first few months of driving. Once you are confident your teen is able to safely transport passengers, be sure to set a maximum limit of friends he can drive around at once. Learning to safely navigate the roads at night takes a lot of practice. Things just don’t look the same once the sun goes down. Most accidents with teens happen between 9:00 pm and 2:00 am, so set an appropriate driving curfew with your teen. For the first few months or more of driving, it’s important to know where you teen is driving to and when he expects to arrive at his destination. Having accountability and oversight can help prevent accidents. Clearly communicate to your teen that he’s responsible for his actions behind the wheel and that bad choices have expensive consequences. Educate your teen about basic car maintenance and ensure that he understands when and how to fill up the tank, check the oil, change a tire and take basic care of the vehicle’s needs. Many parents of teens find that writing out the house driving rules in contract form and having their teen sign it, reinforces the importance of the rules and the consequences for breaking them. 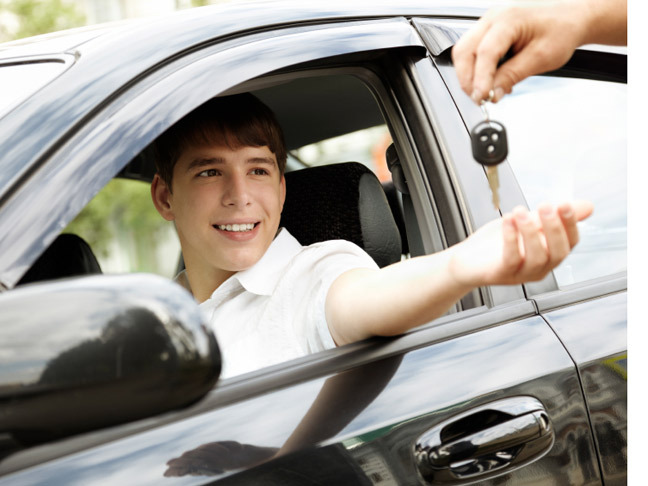 Enrolling your teen in a driver’s education program can also help to educate him about the rules of the road and the importance of driver safety.